The EfficienSea GIS Web Map Application is now ready for use. Feel free to add your data and print your personilized maps! The EfficienSea project has launched an online map portal with data relevant for the entire project. In the map portal, we present data from the different work packages of the project to visualize our work. We also visualizes geographical data relevant to the project from other sources, such as HELCOM and IMO. EfficienSea keeps the portal updated, with new and relevant data from the different thematic areas the EfficienSea project. We will constantly add more relevant layers to the map. You as a user have the possibility to combine data layers from a wide range of different sources. You can see shipping lanes, traffic patterns, risk areas, and different kind of environmental data. 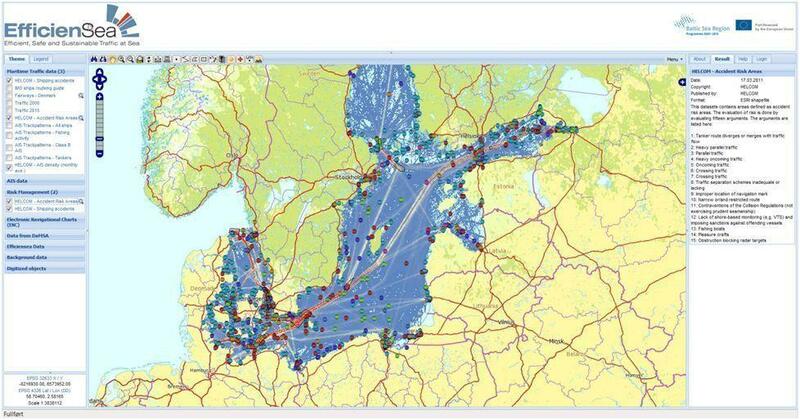 You can for example combine seabird breeding areas with AIS traffic patterns for a specific part of the Baltic Sea. From the application you can print maps and save maps as PDF files. You can also make your own geographical object by digitizing points, lines and polygon in the map. You are welcome to register as a user at any time and save these objects related to your user account. The application has both land maps as well as Electronic Navigational Charts. It is however, important to mention that these maps are not for navigational use. Check out the EfficienSea Web Map Application on http://maps.efficiensea.org.